Here i am sharing Bollywood Movies Releasing 24 June 2016 with full wiki information. Every weekend we get new Bollywood film and this friend latest Hindi thrilling and drama movies are going to release. If you are looking for which film is going to hit the cinema then continue reading this post. 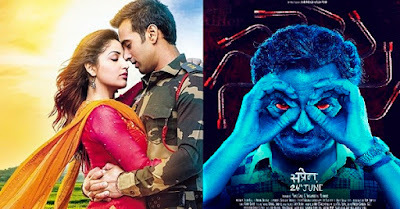 The two most awaited films are all set to hit big screen this weekend and many of you has been waiting for these movies to be released. But if you don’t remember then here we brought to you complete wiki and official trailer videos of the films. Raman Raghav : It is an thriller and drama type film, which is directed by Anurag Kashyap. It revolves around the the notorious serial killer Raman Raghav who operated in Mumbai during the mid-1960s. Nawazuddin Siddiqui is playing the main lead role, while Vicky Kaushalplays the role of a cop in the film. Junooniyat: Pulkit and Yami Gautam once again will be seen sharing on big screen in romantic drama film Junooniyat. this film is shooted in the beautiful valley of Kashmir and Amritsar, will mark the second collaboration of the 32-year-old actor and the 27-year-old actress. They both previously worked in Sanam Re. Its all about the Bollywood Movies Releasing 24 June 2016, Soon i will share more latest report on upcoming movies.